Here it is! My new three rowed Nyckelharpa built by Esbjörn Hogmark. It is now fully adjusted and being introduced into different musical projects and concerts step by step. 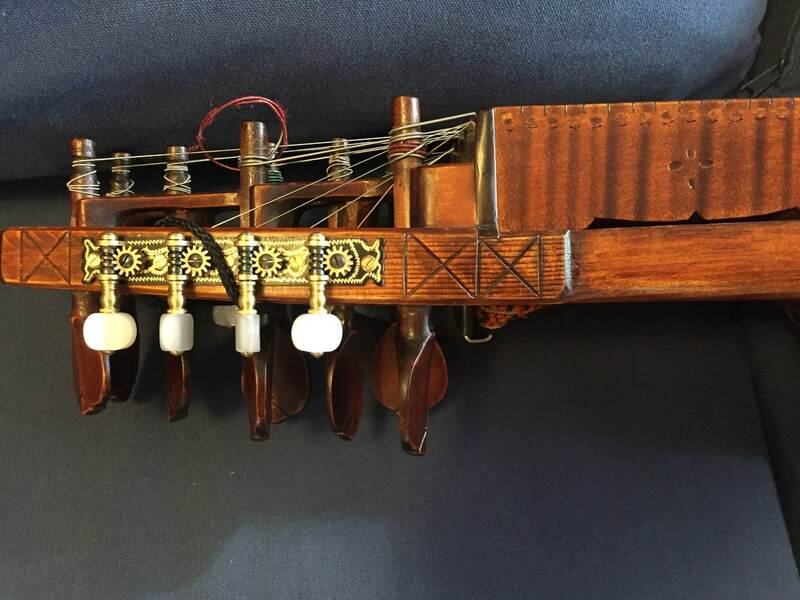 I have been trying and looking at so many different Nyckelharpas over the years. 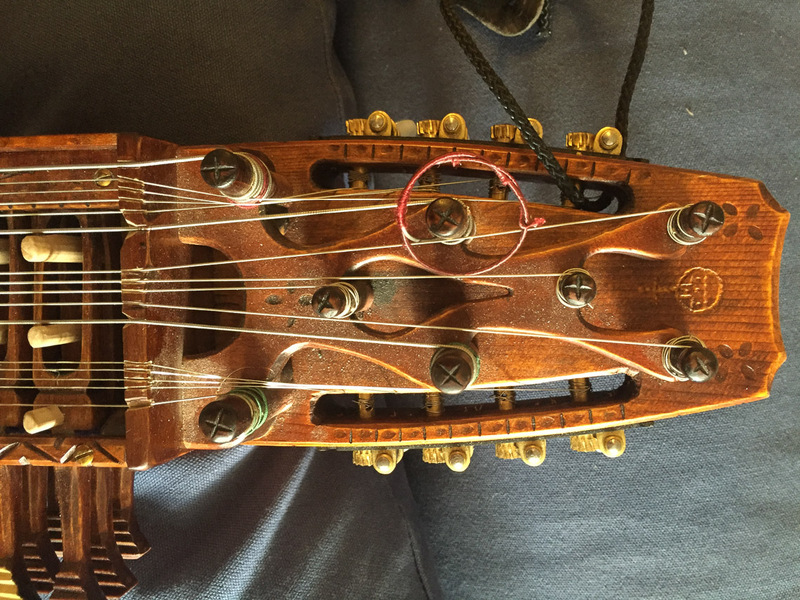 The old beautiful, good sounding and well working ones has inspired me and giving me all these ideas about how a Nyckelharpa should be like, how it should work, how the action should be, how it should sound and how it should look like. This is as close as we could get to all of these ideas this time. Of course it’s a compromise between mine and Esbjörn’s ideas, what is possible to do etc. But some of the features on the wish-list turned out just brilliant. The three rowed NH I have played since 1982 I ordered from Esbjörn and when he asked – How would you like it? I said – exactly like Curt Tallroth’s ( my teacher and friend who died 2001) because that was the only really good NH I had tried. This said without very much knowledge in the matter after playing just two years. But the one I got from Esbjörn 1982 has served me extremely well for 34 years now. The following ideas/thoughts I brought with me and discussed with Esbjörn a couple of years back and he was very generous and decided he wanted to build this as a developing project. 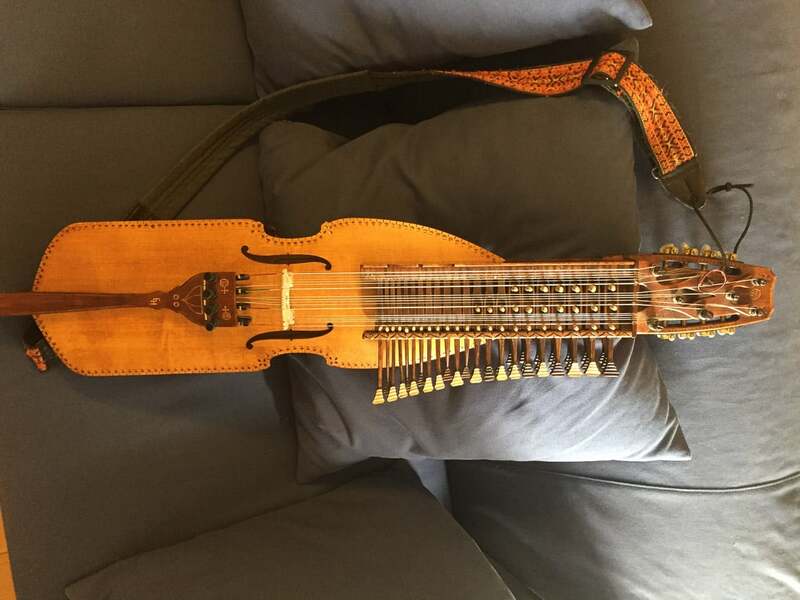 I wanted a long Nyckelharpa! 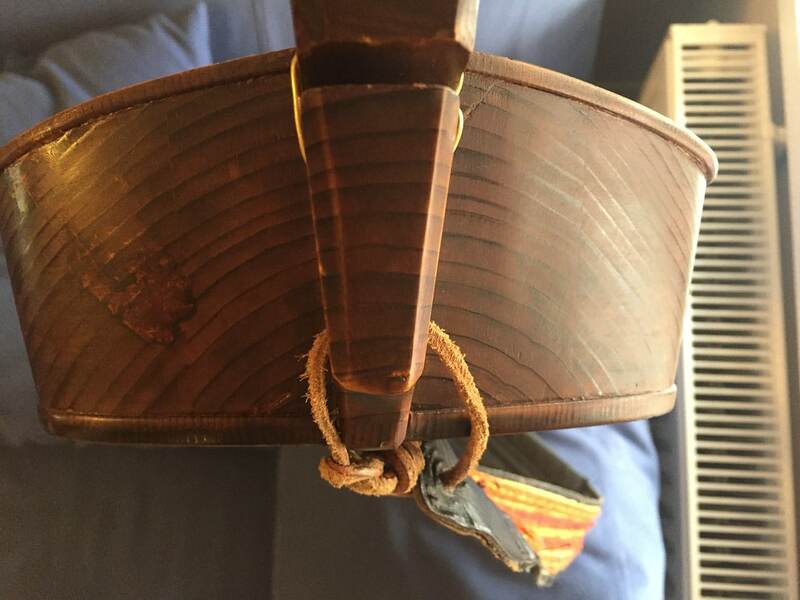 The distance between the end of the tailpiece/stringholder where you rest your arm and the good spot for the hair to go against the strings are almost always too short for a man of my design. Close to 2 meters tall with arms that fits well to that height. To have the most comfortable right hand and arm position I need a longer instrument. After some discussions and tests we agreed upon an instrument-body that is 3 cm longer. 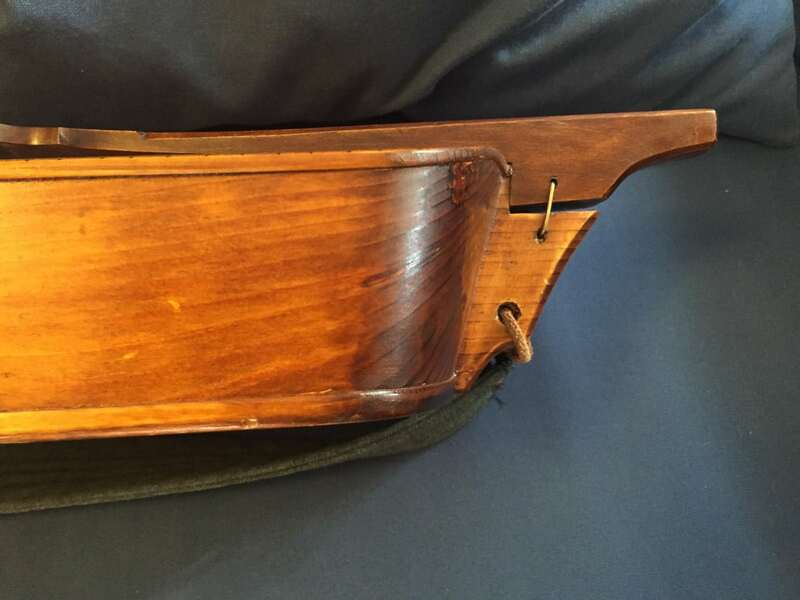 I have been thinking about the reason/function of the upper sound hole on older NH. It is situated under the playing mechanism and often shaped like a heart. 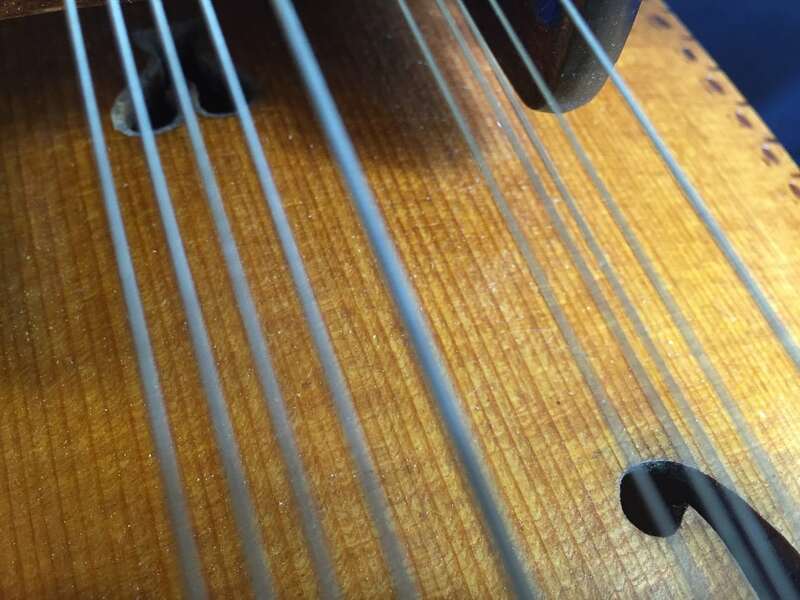 After many experiments with the soundholes on my old three rowed to get rid of resonance frequencies when you are close-miking it or doing recordings I have a theory about the upper sound hole. I have been using tape to make the sound holes smaller and therefore moving the main resonance frequency in the sound box to a lower frequency. That doesn’t look so well so I have also been testing with stealing some volume from the sound box with Styrofoam and in that way move the resonance frequency to a higher frequency. That’s the solution I’m using right now on the old 3 rowed. I have moved the resonance frequency from open G to G-sharp and that is a much easier resonance frequency to deal with. My theory is that this upper hole has been used to trim the main resonance frequency on the NH. On the new long NH I suggested to Esbjörn that he should just build it the way we have talked about and design the f- holes the way he prefers. Then when the instrument was finished we tested the main resonance frequency. Exactly spot on the open G. This situation makes the G enormous when you are close-miking it. So, we looked at a big number of old NH that has an upper sound hole. 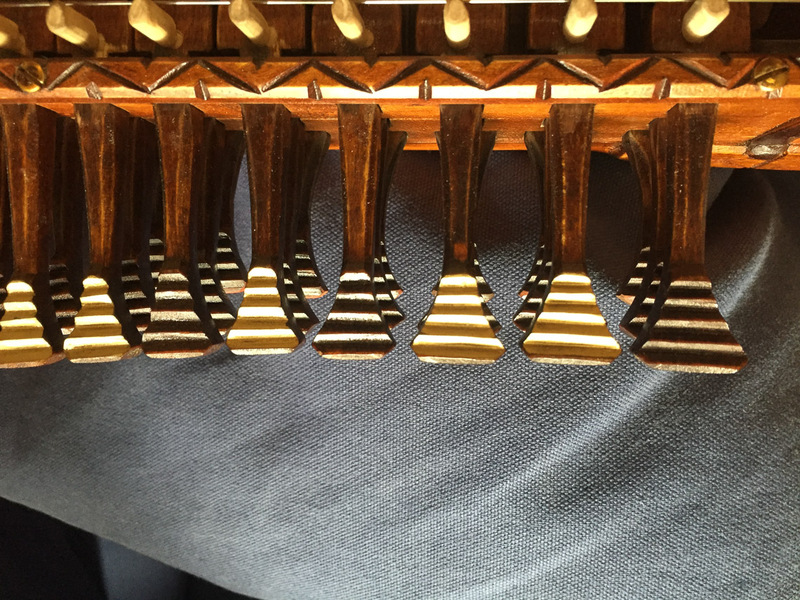 We noticed that all good looking instruments (well made and well designed) had the upper sound hole placed right under the F-key on the first row, the second highest note on the NH. We also studied different designs on the holes and made one we liked. We took the mechanism off and drilled holes in the finished top. Very strange feeling I must say. The result was very good. The main frequency moved up to G-sharp instead and I didn’t notice any other change of the tone quality on the instrument. I wanted a bit more curved top, more like the older instruments and not like the typical 1980s NH with a wide and flat top. All nice Silverbasharpas and Kontrabasharpas I have studied and tried have been shaped out of one piece of very fast growing spruce. This doesn’t go for the top though. The top has been made out of a more slow-growing piece of spruce. The orientation of the wood has also always been the same on the nice ones. The center of the log goes along the back of the instrument. So you can see the year rings on the rear side of the instrument where the string holder attaches. I wanted this design and Esbjörn had saved a log of a very fast growing spruce from Österbybruk. He couldn’t use the back though since it was too cracked. But the result is a very nice looking NH with a very low weight. Fast growing spruce is a very light type of wood. I wanted a tuning head/ head stock with mandolin tuners, 4 + 4 and 4 wooden tuning pegs for the sympathetic strings, also 4 wooden tuning pegs for the playing strings. This put together in a tuning head inspired by Jonas Skoglund’s Silverbasharpa. You can see it on a picture in the book Nyckelharpospelet på Skansen av KP Leffler. 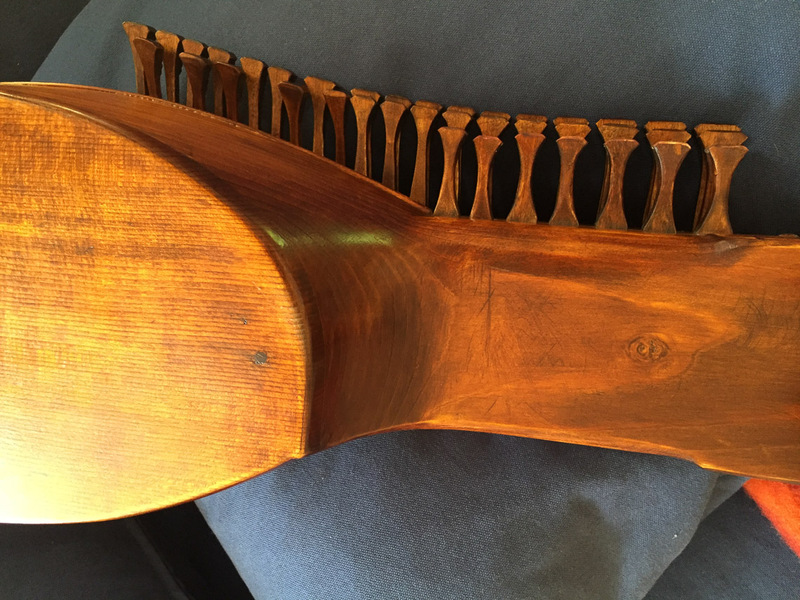 The two most knowledgeable and experienced makers in the 20th century, Eric Sahlström and Hasse Gille often built NHs with this kind of tuning head. I also wanted the beautiful features of the old NH regarding the tuning head where it goes in under the playing mechanism and integrates the neck, the playing mechanism and the tuning head in a very nice way. Esbjörn made his own version of all this and I must say it both looks and works great. The nicest tangent heads I ever played are the ones on my Kontrabasharpa built by Hasse Gille 1989. It’s more or less a replica of a Kontrabasharpa from the 17-hundreds that he repaired about that time. The heads are wide so the distance in between them are about the same rather than the heads having the same width. Esbjörn did his version of this idea and it’s very nice to play. I also wanted less distance between the length of the tangents in the different rowes. Just a couple of mm between 1 and 2 and a little more between 2 and 3. This makes it easier to play double-stops with one finger on two of the rows without touching the tangents on the third row. It takes a little while to get use to but I think it’s worth the effort. I wanted a light NH. We usually say that a NH shouldn’t weigh more than just over 2kg. If it weighs more it’s rough to play it for a long time. My old 3-rowed weighs 2200 g so that is ok. The new one weighs 1700g!! This is half a kilo less hanging on your back and around your neck. That is a big difference if you are playing long concerts or dance gigs. Also the slender NH-body rests closer to your body when you are playing it and that makes it easier on the back and neck as well. The reasons for the low weight are: Light fast-growing spruce in the body, less metal in the tuning head. All the wood in the instrument is there for a good reason. There is no wood “just to be safe” or just to look nice. 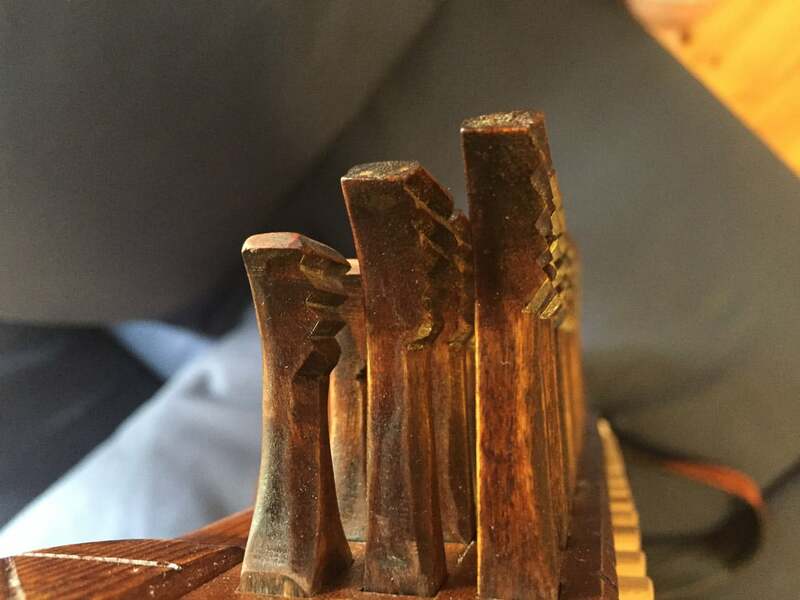 All wood in the instrument has a combination of design and function. I have worked a lot with it since I got it from Esbjörn. I have been moving around the sound post to find the best position, trying different strings, fine tuning the pegs on the tangents, trying different bridges, recording it and listen to it, adjusting, recording again and so on. I’m very happy with the sound and the quality of it is a little bit more nasal but also more clear on the high notes compared to my old NH. It’s still a bit more effort to play every note compared to my old one but it’s getting more and more easy to play. It’s also a lot louder and powerful than my old one! To me it’s an instrument that brings in the best of old knowledge and traditional design together with function, modern ideas, needs and desires. Extremely well done master builder Esbjörn Hogmark!